"Honesty" music video. © 1978 Sony BMG Music Entertainment. It is dark, a lighter version with Spanish subtitles is here. "Honesty" is one of Billy's most popular ballads probably because the sentiment behind the song is so universally held among both men and women. People seek honesty and truthfulness from each other, maybe even more than love and comfort, but it is "hardly ever heard." As Billy says, one can find a lover, a friend, or security, but it's harder to find truthfulness. He is referring not simply to factual veracity, but to emotional honesty and faithfulness. It is akin to loyalty and fidelity. 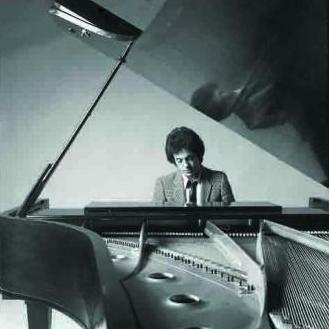 Billy at his piano (1978). Columbia Records publicity photo for 52nd Street. "Honesty" is a beautiful song, and reached #24 on the US Billboard charts. It was nominated for a Grammy for Song of the Year in 1980 (ironically, the Grammy went to "What A Fool Believes" by the Doobie Brothers). Its success, however, continued to pigeonhole Billy as a soft rock balladeer despite the jazzier, harder sound of 52nd Street. The album did receive the Grammy for Album of the Year, and Billy received the Grammy for Best Pop Male Vocal Performance for the album. Billy tells a humorous story on how the lyrics to "Honesty" evolved. You can see him discuss this and "Movin' Out" at a 1992 Q&A session below (right) or listen to this snippet from SiriusXM, right. Billy discusses the song, from SiriusXM. Click on player above. "Honesty" was an even bigger hit in France, reaching #1 on the French charts. Billy and his band appeared on the French television show Melody Varietes in 1979 to promote the song. See video below (left). The song was also very popular in South Korea and Japan, and is in heavy rotation at every karaoke bar in those countries. Jazz harmonica virtuoso Toots Thielemans also did an instrumental cover of "Honesty" (YouTube video). Thielemans is, of course, most well known to Billy Joel fans for playing harmonica on "Leave A Tender Moment Alone." A couple decades later in 2008, Beyonce recorded a cover version of "Honesty," which was a hit in South Korea and Japan. See fan video below (right). And here is a nice instrumental cover of "Honesty" on acoustic guitar. Billy and the band sing (or lip sync) "Honesty" on French television. Their instruments are not hooked up. "Honesty" reached #1 on French music charts. Billy discusses how the lyrics to "Honesty" came about over time, at a Master Class in 1992 (starting at 3:14). Acoustic version of "Honesty" from Master Class in Nuremberg, Germany (1995). This is a fan video of Beyonce's cover of "Honesty" from 2008.